Eleaf iJust Start Plus Battery 1600mAh is an upgraded version of Eleaf iJust Start Battery,it has larger capacity and more improvements compared to the ijust start battery. 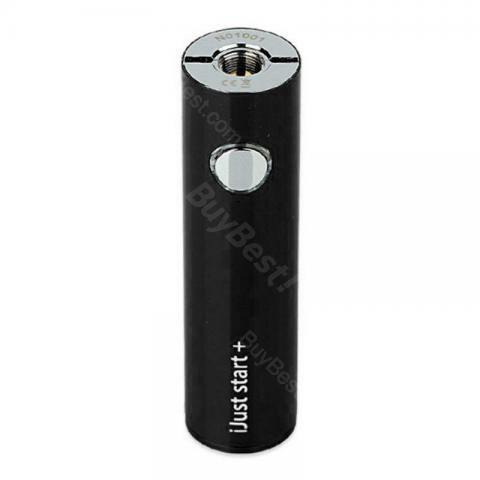 Eleaf iJust Start Plus Battery 1600mAh is an upgraded version of Eleaf iJust Start Battery, it has a larger capacity and more improvements compared to the ijust start battery. The main feature is direct output voltage. The capacity of ijust start battery is 1300mah, ijust start plus battery is 1600mah. Furthermore, there are atomizer protection, no atomizer protection, short circuit protection and low voltage protection, full protection makes vaping more joyful and carefree. Still, we got 3 colors for you to choose. We have a long warranty for this item, protection all the way from buying to using. Vaping: long press the button to take a puff. Charging: charge the device by connecting it with wall adapter or computer via USB cable. The button light will turn red when the device is charging and the light will go out once fully charged. It takes around 3 hours to fully charge the battery with 1A wall adapter. Short-circuit Protection: short-circuit occures with the white button light flashing three times. Battery LevelLight Condition60% - 100%Stay lit30% - 59%Slowly flashes10% - 29%Moderately flashes0 - 9%Flashes in frequency. my old battery broken.i order a new battery.Delivery to Moscow for 22 days, sending the package the next day. Packed very well: a tight envelope with a puppy, The battery itself is slightly different, but, apparently, this is an updated design. The code on the manufacturer's website is confirmed.